In my room, busy with my smartphone, my brother strolls in, sits and informs me about martyrdom of Burhan (RA). Hours later, while watching volleyball match between neighborhood groups, somebody let me know that Burhan accomplished suffering in a village of South Kashmir, nonetheless, I couldn’t affirm the news by some stable source or myself on web as I had no access to internet at that point. My brother’s words were adequate for me. Listening to these words, I called my friend and think about what, he is going to go to Tral at night and that too on foot, such is the passion of the guy for freedom. Actually, he let me know that countless men are wanting to go to Tral, no matter what happens. Not in my deepest contemplation, I knew about the repercussions of the tragic episode, albeit one of the Telecommunication Company’s system gave a notion of the restoration of contention as it was off the telephones. Thus, I rested. The following morning was the start of dawn of the third Intifada (2008, 2010 and 2016). The skies had thundered and the night had sobbed over the doomed occurrence that had come to pass for Kashmir. and the shops were shut. The terribleness was scattered everywhere throughout the atmosphere. Not a solitary soul was in his/her rationalities. 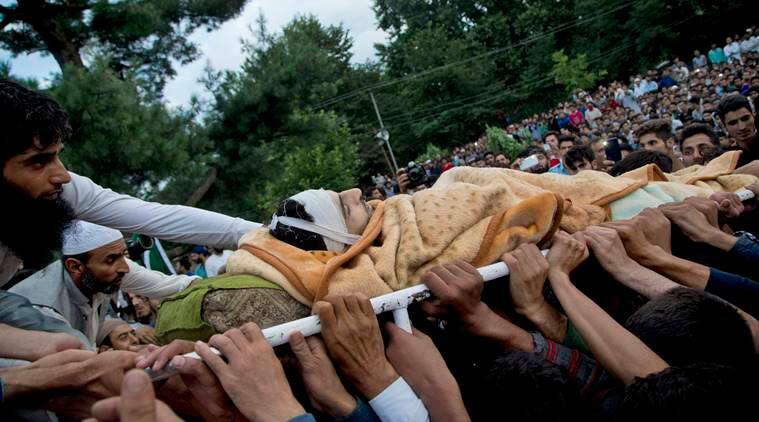 There were some youth of my age planning to march towards Tral to attend the funeral. As we were perched out and about talking about how the event happened, a vehicle pulled up before us. When the vehicle pulled up, some of the youth plunged into the vehicle. However, I didn’t stand up to join them. At the point when the car pushed forward, I saw my mom’s cousin sitting inside the vehicle calling me to join and thus I joined in. Out of the blue, the young fellows began to serenade Azadi slogans not fretting whether there was an armed force camp situated on the roadside or whatever else. Amid our ride, the driver would stop when young fellows and ladies, kids and elderly individual, progressing towards Tral by walking, would put their thumb out just to be caught a ride for the sole reason of going to memorial service payers on time and getting the look at their legend for the last time. After coming to a town called Harie subsequent to driving through Marhama, one could see swarms of individuals who had gone ahead of schedule in the wee hours of morning or in the mediating night (8th/9th of July) returning subsequent to watching burial service supplications either by walking or in vehicles. There was as an equivalent number of individuals on the way to Tral by foot, hence the road was packed. compartments. One could see lunch being served in polythene sacks at one place or in big copper plates like in pre-marriage ceremony at some other place. The Kashmiris are known to ascend to such unfortunate events where they demonstrate vital regard, love and sympathy toward their brethren and show incredible hospitability, amiability, sociability and warmth. from the village. All the while, they had destroyed the bunkers setup on the either sides of the street and there was smoke emanating from the bunkers. passing by the stone pelters while keeping my eyes concentrated on the army camp. A couple of girls ran quickly towards safe end and so did I along with them. This was the first time I witnessed the stone pelting hand-to-hand. On reaching the safe zone and leaving behind the army camp, I waited for my friends at a reasonable distance. However, they did not turn up; perhaps they were scared to cross the bridge and were trying to evade any catastrophe. After waiting for a couple of minutes, I resumed my journey unaccompanied. On the road, I could see some recognizable faces though rest happened to be unknown. Keeping my resolve firm, I manned the distance and reached Eidgah where the funeral prayers had to be observed. At Ladiyar where we parked our vehicle, one of my friends who had gone in the intervening night (8th/9th of July), told me that they had offered funeral prayers at 9 am and couple of funeral prayers will be held more. The eidgah spanned over a vast area and one could see large number of people, men, women and children, sitting in flocks there. Everybody was despondent, dejected and heartbroken. World seemed to have come to a halt and it was like something big had come about. I walked out of the eidgah to look for water so as to make ablution. I spotted a stream of water nearby and made ablution. 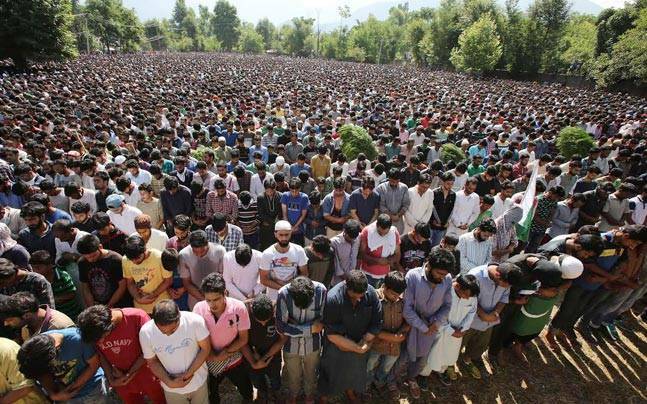 Coming back towards eidgah, I saw people in huge numbers standing on the roadside while some of them mounted on the walls of eidgah facing toward north. Once I got inside the premises, I walked towards the front of it. There were people who had climbed on top of the Mihrab, trees and walls. A tractor trolley in the centre was used as a podium for the speakers. As I sat on the ground beside a motherly figure, one elderly man started to speak and after speaking for about 10 minutes, a young man was escorted to the podium. Once he started to speak, I did him the courtesy of listening to what he said. Like advertisements, his speech was paused by Azadi slogans. The whole premises was jam-packed and thus reverberated with the Hum Kya Chahte Azadi and the like slogans. People, mostly young men, were smacking each other on the trolley so as to get their feet on it. This young man after speaking over 10 minutes as a result of thumping and whacking eventually left the podium. 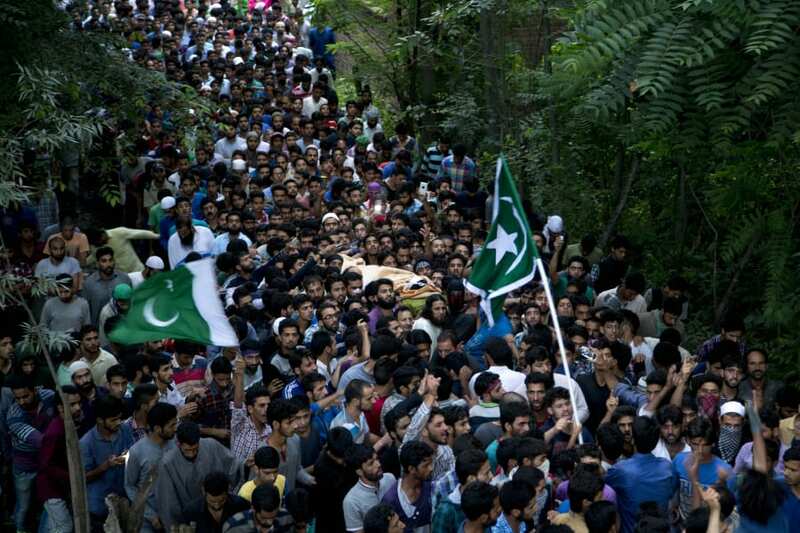 After spending half an hour there, finally the hero of all, the leader, the rebel, the all-time favorite, the son of the soil, the pride of Kashmir, the poster boy, the heartthrob, BURHAN, wrapped in a blanket, was being carried on a white iron bed on shoulders. All eyes gazed at him. I had not seen him earlier though I had seen him in his viral Facebook videos. Round about thirty young men, trying hard to have Burhan in their lap, discomfited Burhan’s body. This scene could have been evaded easily had there been proper supervision. I saw several women kissing Burhan amidst of all the disorder at the podium. We finally offered funeral prayers. After this, He was carried to be laid to rest in the nearby graveyard.